To edit a tileset it needs to be opened explicitly for editing. External tilesets can be opened via the File menu, but in general the quickest way to edit the tileset when it is already open in the Tilesets view is to click the small Edit Tileset button in the tool bar below the tileset. This tileset defines a fixed size for all tiles and the image from which these tiles are supposed to be cut. In addition it supports a margin around the tiles and a spacing between the tiles, which allows for using tileset images that either happen to have space between or around their tiles or those that have extruded the border pixels of each tile to avoid color bleeding. In this type of tileset each tile refers to its own image file. It is useful when the tiles aren’t the same size, or when the packing of tiles into a texture is done later on. Regardless of the type of tileset, you can associate a lot of meta- information with it and its tiles. Some of this information can be for use in your game, like collision information and animations. Other information is primarily meant for certain editing tools. A tileset can be either embedded in a map file or saved externally. Since Tiled 1.0, the default and recommended approach is to save your tilesets to their own file. This simplifies your workflow since it makes sure any meta-information is shared between all maps using the same tileset. You can access the tileset properties by using the menu action Tileset > Tileset Properties. The name of the tileset. Used to identify the tileset in the Tilesets view when editing a map. A drawing offset in pixels, applied when rendering any tile from the tileset (as part of tile layers or as tile objects). This is can be useful to make your tiles align to the grid. A background color for the tileset, which can be set in case the default dark-gray background is not suitable for your tiles. When the tileset contains isometric tiles, you can set this to Isometric. This value, along with the Grid Width and Grid Height properties, is taken into account by overlays rendered on top of the tiles. This helps for example when specifying Terrain Information or editing Wang Sets. It also affects the orientation used by the Tile Collision Editor. This is a read-only property for tilesets based on a tileset image, but for image collection tilesets you can control the number of columns used when displaying the tileset here. This property only exists for tilesets based on a tileset image. Selecting the value field will show an Edit… button, allowing you to change the parameters relevant to cutting the tiles from the image. Of course, as with most data types in Tiled, you can also associate Custom Properties with the tileset. This property refers to custom types defined in the Object Types Editor. See the section about Typed Tiles for more information. Represents a relative probability that this tile will get chosen out of multiple options. This value is used in Random Mode and by the Terrain Brush. Only relevant for tiles that are part of image collection tilesets, this shows the image file of the tile and allows you to change it. Terrain information can be added to a tileset to enable the use of the the Terrain Brush. See the section about defining terrain information. A tileset can contain any number of Wang sets for use with the Wang Brush. See Defining Wang Tile Info for more information. 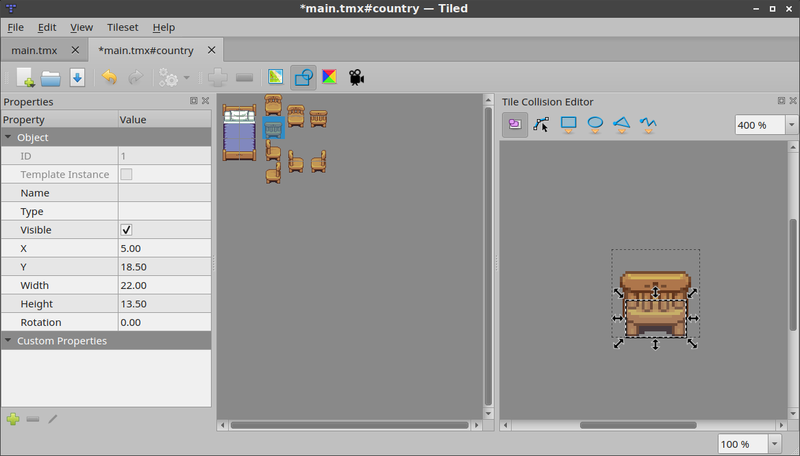 The tile collision editor is available by clicking the Tile Collision Editor button on the tool bar. This will open a view where you can create and edit shapes on the tile. You can also associate custom properties with each shape. Usually these shapes define collision information for a certain sprite or for a tile representing level geometry, but of course you could also use them to add certain hot-spots to your sprites like for particle emitters or the source of gunshots. Check out the Tiled2Unity tool by Sean Barton for a great example of what you can do with this information. It can take the collision shapes for all tiles and generate a single collision mesh from it, as demonstrated in the Mega Dad Adventures post. 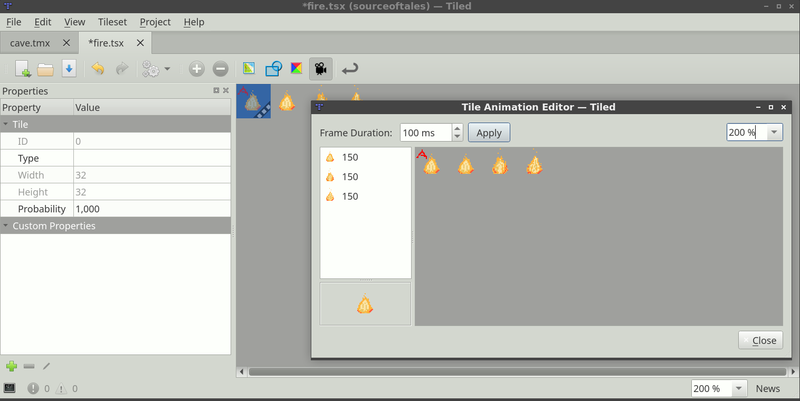 The tile animation editor allows defining a single linear looping animation with each tile by referring to other tiles in the tileset as its frames. Open it by clicking the Tile Animation Editor button. Tile animations can be live-previewed in Tiled, which is useful for getting a feeling of what it would look like in-game. The preview can be turned on or off via View > Show Tile Animations. Select the tile in the main Tiled window. This will make the Tile Animation Editor window show the (initially empty) animation associated with that tile, along with all other tiles from the tileset. Drag tiles from the tileset view in the Tile Animation Editor into the list on the left to add animation frames. You can drag multiple tiles at the same time. Each new frame gets a default duration of 100 ms.
Double-click on the duration of a frame to change it. Drag frames around in the list to reorder them. A preview of the animation shows in the bottom left corner.